With the growing world and latest technology which is taking over our regular work methods, we feel the need to upgrade ourselves continuously in every aspect. There are new and innovative ideas continuously being discussed for your company and business to stay in the growing competition. There are so many ways to convey messages in front of your customers. Video brochures are one of the most interesting and creative ways to bring electronic devices to marketing. It’s really exciting, isn’t it? Recently, Video brochures have taken all over the market and they are really trending. Most of the companies are using this new way of extremely engaging and memorable way of presenting their messages to have a powerful impact on their customers. If you are thinking about what exactly a video brochure is, let me tell you, a video brochure is an innovative marketing tool and a device that can be used in your business. 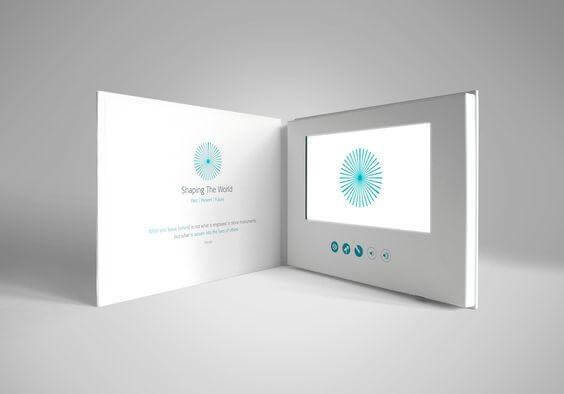 It is a tool that combines the power of high-resolution video with the precision of direct mail and printed video cards with minimum equipment. It features a thin LCD screen and speaker. The videos for the clients can be uploaded and the device battery can be recharged via USB. It also has a feature of auto start, each card is set-up to auto start on opening. The best way to reach people is by marketing and letting them know your message. Just as you watch your TV commercials and get to know about the company and their message. Video brochure also does the same work, but by investing less. Video brochures are the best way of marketing your message in a most creative and exciting way which will have an unforgettable impact on the viewer. Video brochures have an everlasting impact on the customer which makes them remember the company’s name while buying the products. This helps companies put their brand name forward in the best and presentable way. Video brochures help companies increase their sell. It attracts customers and captures the customer’s attention. Video greeting cards, video books are some new and innovative ideas that help attract customers, increasing their demand and therefore increasing the sell. Video brochures can be a great way to train and educate people. It helps the presenter in explaining and the receiver can have a great impact which makes it easy in understanding. It solves many problems by avoiding the loss of time, travel expenses and the difficulty to bring all the people together is also solved. Video brochures connect and inspire people by making an impact. People feel connected and start relating to the cause and purpose of the message. Innovative video cards are used to promote your business and show your appreciation to your customers and help customers connect more. Video brochures help you stay creative, innovative, connected and most importantly, your message is passed in such a way which allows people to understand your story behind the message.